According to a new market report published by Transparency Market Research titled “Sheet Metal Fabrication Services Market – Global Industry Analysis, Size, Share, Growth, Trends, and Forecast, 2018 – 2026,” the global sheet metal fabrication services market is expected to reach US$ 4.4 Bn by 2026, expanding at a CAGR of 1.7% from 2018 to 2026. North America held the highest market share in the sheet metal fabrication services market in 2017. The sheet metal fabrication services market is witnessing steady growth due to the increased demand from aerospace and aviation industries. Growth in the commercial airlines and defense aircrafts market will drive the sheet metal fabrication services market in the coming years. Demand for advanced technologies in the defense industry will create a favorable environment for the growth of this market in the near future. The low-interest rates and low fuel prices were identified as key factors that are responsible for the growth of the automotive market. The outlook for the automotive industry seems promising, with sales growing substantially, without any signs of slowing down. The number of leading automotive and manufacturing industries that employ sheet metal fabrication is growing year on year. Rising demand for iron and steel in the automobile industry has led to the growing significance of sheet metal fabricators. Sheet metal fabrication for the automotive industry typically involves superheating metals and quenching it inside the die itself, resulting in a high-strength metal part with various desirable properties. Advanced laser technology can enable the necessary cutting and trimming of these parts, which may be a big contributor to why this method is gaining popularity. The sheet metal fabrication services industry is growing. The market is witnessing rise in deployment of CNC machine tools as one of the primary tools to undertake several applications such as shaping and molding. Advancements such as motion control software functions, high-speed smooth tool center point, jerk control, and AI contour control have greatly reduced the cycle time, along with cost reduction per part with augmented ergonomics, thereby increasing the demand for sheet metal fabricated products. The sheet metal fabrication services market is growing and is highly competitive. Manufacturing, electronics, automobiles, and telecommunication are some of the major industries contributing to the growth of the market. Bending and punching of sheet metal is a common and vital process and has numerous applications which includes machine components, ductwork and industrial systems, architectural and structural components such as filters, panels, downspouts, and tank bodies. By form, the bend sheet form segment is expected to have the highest CAGR of 1.9% from 2018 to 2026. The growth of the automotive industry, construction industry, and growth in metal and manufacturing industry is driving the demand for bend sheet in the global market. Rise in urbanization and increased construction activities are adding to the growth of the bend sheet segment globally. For most applications however, bending will produce essentially no change in the thickness of the sheet metal. Punch sheet and cut sheet segment is expected to have a CAGR of 1.7% over the forecast timeframe. 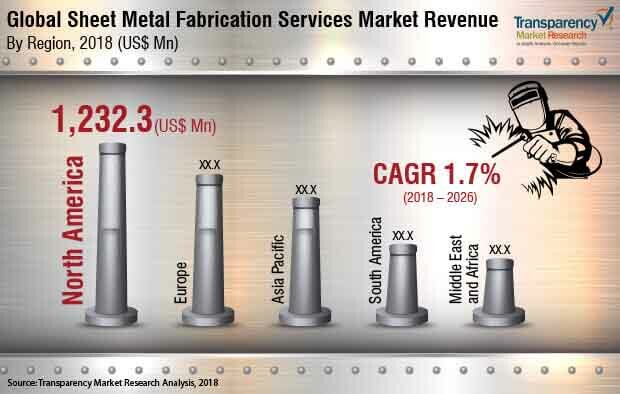 North America accounted for 32.1% of the global sheet metal fabrication services market in 2017 and is anticipated to continue its dominance over the forecast timeline. Asia Pacific region is witnessing significant growth with strong demand from applications in discrete manufacturing such as electronics and manufacturing segments. The Asia Pacific market is expected to have the highest CAGR of 2.3% over the forecast period. The sheet metal fabrication services industry is fragmented across the world. Some of the industry participants of this market are All Metals Fabricating, Inc., BTD Manufacturing, Inc., Classic Sheet Metal, Inc., Dynamic Aerospace and Defense Group (Hydram Engineering), Ironform Corporation, Kapco Metal Stamping, Marlin Steel Wire Products LLC, Mayville Engineering Company, Inc., Metcam, Inc., Moreng Metal Products, Inc., Noble Industries, Inc., O’Neal Manufacturing Services., Ryerson Holding Corporation, Standard Iron & Wire Works, Inc., and The Metalworking Group.